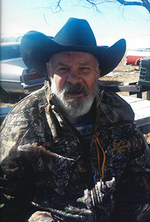 Obituary for Donald Burl "Donnie Grand" Luxon Sr.
Donald Burl Luxon, Sr. was born December 14, 1939 in Rosebud, SD. He passed away June 28, 2018 at the Winner Long-term Care Center. Survivors include 5 children: Mary Ann Luxon, Donald Harold 'Guy' Luxon, Jr., Webster Mahan Luxon, William Paul Luxon and Stephanie Anna Louise Luxon; grandchildren; great grandchildren; and 3 siblings: Donna Holsworth, Robert Miller and Glenda Miller. He was preceded in death by his parents: Charlotte Wright, Clement Miller, Sr. and Harold Luxon; son Stacy Louis Luxon; and 8 siblings: Emmett Miller, Robert Miller, Juanita Miller-Torres, Clement Miller, Jr., Roger Miller, Joanne Miller-Corbin, Elizabeth Miller and Michael Miller.